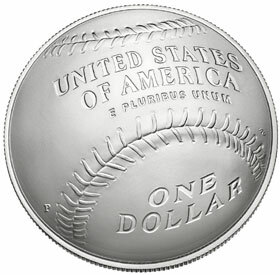 The latest weekly United States Mint numismatic product sales report comes as sales have reopened for the 2014 National Baseball Hall of Fame Silver Dollars. Also, the closely watched 2014 American Coin and Currency Set is now showing sales equal to the established product limit. The National Baseball Hall of Fame Commemorative Coins were first made available for sale to the public on March 27, 2014. The innovative curved shape and popular subject matter resulted in strong interest from both collectors and the general public. A prompt sell out had occurred for the gold coins offered under the program. By April 9, the silver dollars had also received orders to meet the maximum mintage of 400,000 pieces. The US Mint continued to accept orders for the silver dollars on a waiting list basis until April 21, when a sell out was declared. As of yesterday, the US Mint has reopened sales for both the proof and uncirculated versions of the Baseball Hall of Fame Silver Dollars. Apparently, a number of orders had to be cancelled due to payment issues, making additional coins available within the established maximum mintage. This week’s sales report shows negative adjustments made to previously reported figures, possibly indicating the number of coins still available. Total sales for the proof version are indicated at 265,430 and the uncirculated version at 131,004, for a combined total of 396,434 pieces. The silver dollars are currently offered priced at $52.95 for the uncirculated version and $56.95 for the proof version with an ordering limit of 100 units each per household imposed. This week’s sales report shows the 2014 American Coin and Currency Set at cumulative sales of 50,000 units, matching the indicated product limit. This product initially seemed to be a simple repackaging of the 2014 Native American Dollar with a $1 Federal Reserve Note, but it was later confirmed that the coin included in the set carried a special enhanced uncirculated finish. As word began to spread, sales for the product surged. On its first appearance on the weekly sales reports, the set had shown sales of 9,720 units. This rose to 14,072 in the following week, then 38,299, and now 50,000 units. Throughout the sales period, the product was frequently out of stock and unable to be ordered. Late in the sales cycle, a household ordering limit was imposed. Although the current sales are indicated at the 50,000 limit, the product is not yet officially listed as sold out on the US Mint’s retail website. I hate to ask this again, but when you talked to the Mint did they give any indication when the sales of the First Spouse Gold Coins for 2013 were going to be discontinued? Leo- I followed up with the Mint again. They have not been very responsive lately. I will have a post on Mint News Blog about the “Last Chance” section on the Mint’s website and also include any information I receive between now and then. Thanks for checking on the FS. Maybe the Mint doesn’t even know when they will stop selling them. They are probably no to happy getting stuck with 1500 to 2000 unsold coins. Wondering about the 2014 proof platinum eagle (?). With indicated sales of only 4,813 coins – the mint website lists them as “Out of Stock”. I know that’s not the same as “Sold Out” – but wouldn’t that be something if they are complete at this LOW mintage. In 1915 the US population was close to 100 million. They were $100 each then – about a month’s salary average then. Fast forward to now. The US population is now close to 320 million. around 1,850 coins each MS. Proof more at 2,520 coins each. must be embarrassed to keep on selling these. in 2016 a male could easily qualify to be on a coin. Not only are the2014 1 oz Platinum eagles coins listed as out of stock on the web page, but they are listed as no longer available on the mints sales data page from which the above data comes from. If my calculations are correct than the current sales of the 2014 Platinum American Eagle proofs (1oz) only have a mintage of 44 more than the rarest, 2008 (the fractional 2008 1/2 oz and 1/4 oz had lower mintages too). If there are some returns it might be the winner, if not very close. Several of the uncirculated have a lower mintage but they aren’t quite as popular as the proofs. Also I’m not sure about this but I believe that the burnished (uncirculated) had the same reverse as the proofs, making the amount of coins with that design higher. @Mage, You are correct about the burnished (uncirculated) platinum eagles having the same reverse designs as the platinum proofs. In my opinion, the mint really needs to provide some transparency with regards to any coins that are approaching sell-out status. The 2014 Platinum proof went on sale October 20 and was sold out without any warning in less than two months. On the old mint website, backorder status was usually attached to a coin shortly before a sell-out. Things don’t appear to be operating that way on the new mint website. It would be nice if a “limited quantity” tag was attached to any item when less than 10% of its production was still available for purchase.